​The game is very simple. Kids have to match the pictures that are the same. The aim is to find all the pictures. … so … Keep your child busy with Tiko! ★ This game teaches kids 100 words in 10 categories. Let kids have fun and let them learn new words with native speakers! ★ Check out all the free categories and if your children like it purchase more. This app is similar to Monkey Preschool Lunchbox, which also has an animated character and a memory game. Additionally, Tiko brings much more items and audio recordings in various languages. ★ Tiko Kids Memory Game helps kids to improve their concentration. ★ Tiko Kids Memory Game is a matching game. ★ Tiko Kids Memory Game teaches kids foreign languages. ★ Tiko Kids Memory Game helps kids with English language. ★ Tiko Kids Memory Game helps kids with French language. ★ Tiko Kids Memory Game helps kids with Czech language. ★ Tiko Kids Memory Game was tested and validated in kindergartens. 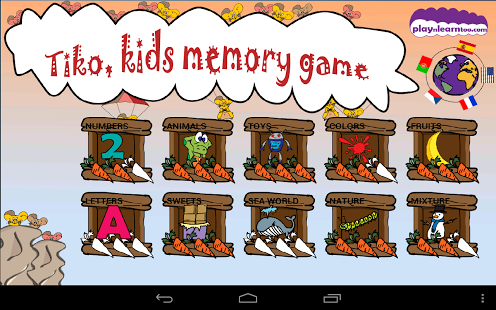 ★ Tiko Kids Memory Game uses cute HD graphic, which kids love. 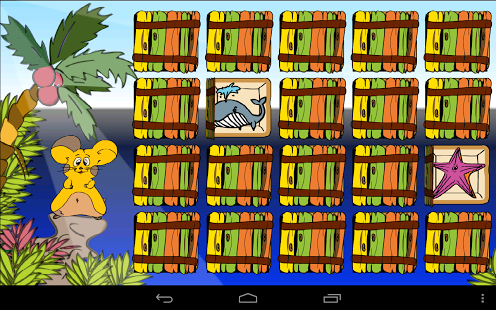 ★ Tiko Kids Memory Game offers half of the available content FREE without ads. 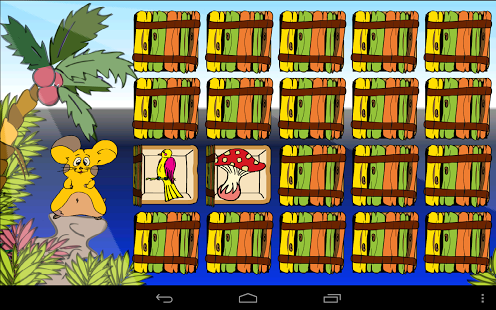 ★ Tiko Kids Memory Game is a puzzle. Tiko, kids memory game comes with 10 categories. ★ SEA WORLD: Do your children love to play on a beach? Then this category is just perfect for you! Kids will know how to say: coral, crab, dolphin, fish, jellyfish, octopus, shell, starfish, turtle, whale. ★ NUMBERS: 1-10, very useful category especially for preschool kids. Knowing the numbers in various languages is always handy. ★ COLORS: Kids can describe objects by color! ★ LETTERS: This category helps preschool kids with letters. ★ SWEETS: This category is very sweet! Kids love it! The category includes: biscuit, cake, candy, chocolate, cotton candy, cupcake, ice-cream, jam, lollipop, pancakes. Check It out! ★ NATURE: Does your kid enjoy walks in nature? Then you need to check this category out. The category includes: bee, bird, butterfly, caterpillar, eggs, flower, leaves, mushroom, snail, tree.